Reynolds Lake Oconee is a lake and golf community offering 117 holes of championship golf on the shores of Lake Oconee. Located 75 miles east of Atlanta via Interstate 20, Reynolds Lake Oconee’s long list of amenities is headlined by five of the best golf course designers in the business—Jack Nicklaus, Bob Cupp, Tom Fazio, Rees Jones and Jim Engh. Send me more information about Reynolds Lake Oconee! Reynolds enjoy more than 374 miles of shoreline. In addition to its beautiful setting along more than 374 miles of Lake Oconee shoreline, the community offers residents and guests four marinas, four clubhouses, 16 tennis courts and miles of walking trails, engaing natural scenery and The Ritz-Carlton Reynolds, Lake Oconee for vacationers and real estate prospects. Most of the homesites and cottages now offered at Reynolds Lake Oconee overlook either the lake or one of six championship golf courses. Some even offer a combination of both golf and lake. Send me more information about Reynolds Lake Oconee! Reynolds Lake Oconee–where generations come together. Take the grandkids tubing or invite your neighbors for a moonlight cruise. Finish the day watching the sun set on Lake Oconee from your back porch. Whether you live on the lake or not, Reynolds Lake Oconee’s four full-service marinas assure that access to the lake is easy for everyone. And whatever the view, year-round residences and vacation homes here blend in with the natural surroundings and offer easy access to all amenities. 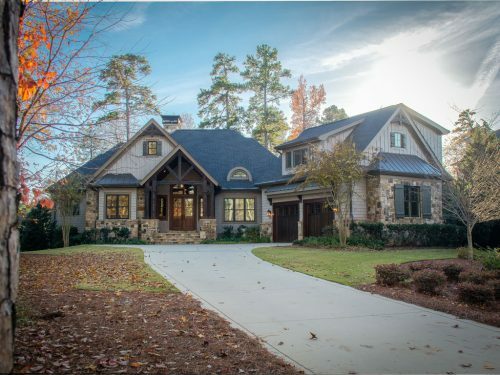 Southern Living Magazine chose Reynolds Lake Oconee as the location home for its renowned Idea House. Send me more information about Reynolds Lake Oconee! Sit back and relax on your porch at Reynolds Lake Oconee. This 6,698-yard, par-72 course at Reynolds Lake Oconee was originally designed by noted architect Bob Cupp along with U.S. Open champions Fuzzy Zoeller and Hubert Green. In addition to hosting a Quick Six, The Preserve course takes advantage of the natural rolling topography with the end result being an immensely playable course with back tees challenging enough for low handicappers and forward tees forgiving enough for beginners. The original golf course built at Lake Oconee, The Landing made its landmark debut in 1986, setting the stage for what has become a premier golf destination. The par-72 course, which plays to a maximum of 7,048 yards, was designed by award-winning architect Bob Cupp. Reynolds means great golf and great lake views. This Tom Fazio-designed course features three distinct nine-hole layouts fashioned from the richly colored textured “paints” of grass, sand, trees and water found in the hardwood forests and rolling terrain of the region. Impressive changes in elevation, dense forests and breathtaking views make this award-winning 27-hole course a true masterpiece. Defined by the dramatic routing along the Lake Oconee shoreline, this Rees Jones design is a true risk/reward layout. The Oconee course offers inspiring lake views while presenting options to play shots over inlets of Lake Oconee or carry corners of tree-lined doglegs. Reserved for Member-only play, The Creek Club captures the natural essence of the undulating terrain unique to the Lake Oconee region. Golf course architect Jim Engh utilized the innate detail of the property, which lends itself to spectacular viewing corridors from endless angles. Send me more information about Reynolds Lake Oconee! 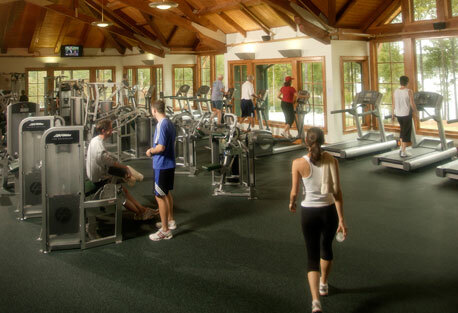 Fitness facilities offer advanced cardio equipment from Matrix, Technogym and Life Fitness. Life at Reynolds is all about lakeside living–golf, boating & more. Located within Georgia’s inland coast, Reynolds is surrounded by vibrant small towns and thriving cities. With an abundance of Southern zest and hospitality, Reynolds is perfectly situated near a wide variety of schools, performing arts and entertainment facilities, and health centers. Reynolds is just 85 miles from Hartsfield-Jackson Atlanta International Airport, the busiest airport in the world. Relax with new friends at Reynolds National Tavern. Reynolds Lake Oconee Properties is extending a special offer for those interested in real estate opportunities to experience this community of uncommon character. Send me more information about Reynolds Lake Oconee! Get the whole family involved in the great game of golf. The Stay & Play Package is the perfect immersion into Reynolds Lake Oconee to experience our top-ranked golf courses and private accommodations in a cottage or condominium. This offer provides the option to play The Landing, The National, The Oconee or The Preserve course, all while enjoying the breathtaking scenery on Lake Oconee, unmatched amenities and the Southern hospitality that Reynolds has to offer. Enjoy one round of golf per person for each night of stay, as well as replay rounds available at special rates. Send me more information about Reynolds Lake Oconee!